The Pioneer X-SMC3 is a jack of all trades, and hopefully a master of them too. As well as acting as a conventional speaker dock that neatly houses your Apple iPod, it also sports AirPlay for wireless streaming to your Apple devices. What's more, it can also stream music from any networked device with built-in Wi-Fi, as well as offering enough sockets to plug in your other gadgets. Oh, and it does all this for a rather tempting £200. Compared with the likes of Philips Fidelio DS9000 or the Monitor Audio i-Deck, the X-SMC3 looks a little old-school. The more traditional arrangement of square speakers either side of the central controls and the black finish simply doesn't inspire the same levels of excitement. But it's still a beautifully made unit, with a robustness missing from many docks and a tray that pops out to house your iPod when needed. The front panel houses a 2.4in colour LCD display that makes it remarkably easy to configure and shows album art during playback, while the red-digit clock to the right has a certain retro charm. There's nothing retro about the feature list though. 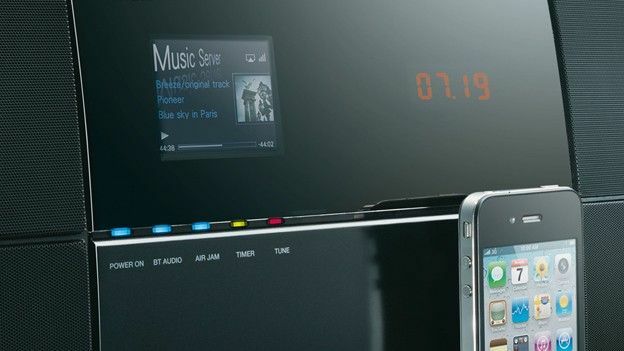 AirPlay is the obvious highlight but where the Pioneer X-SMC3 has the edge over the likes of the B&W Zeppelin Air is with its internet radio access courtesy of vTuner, while DLNA certification means you can stream music from other devices (PCs, NAS drives etc) on your home network. If you're not hooked up, no problemo – you can play music from USB memory devices through the port on the front, with support for MP3, WMA, AAC, WAV and FLAC. If you install Pioneer's free Air Jam app on your iPhone, iPod touch or iPad, you and multiple users can submit songs from those devices to a common Air Jam playlist via Bluetooth – great fun at parties. That said you need to invest in the optional AS-BT200 Bluetooth adapter. Other connections include an Ethernet jack, 3.5mm minijack input, a composite video output (for watching iPod videos) and antenna input for the built-in FM/AM radio. Using the Pioneer X-SMC3 is a piece of cake. The menus on the full colour screen are crisp and logically structured, while the uncluttered remote doesn't let the side down either. Network setup is a question of following the onscreen prompts and punching in passwords using the slick text entry screen. With 40W of power and four passive radiators backing up the two full-range speakers, sound quality is fabulous – loud, bassy and teeming with top-end detail, although not its not quite at the same level as the top-tier Denon CEOL. The overall sound is remarkably poised and fulsome at loud volumes, side-stepping the thinness and distortion of many speaker docks at this price – but it still can't match the refinement of docks like Monitor Audio's i-Deck. Streaming performance is impressive – and we didn't have a single streaming drop-out during our test, whether using DLNA, web radio or AirPlay. It may lack the modern-day panache of other docks on the market, but the Pioneer X-SMC3 still has what it takes to make it into our list of the best ipod and mp3 docks with a stellar feature list and sparkling sound quality. If your digital music is scattered all over your network, this is the perfect way of bringing it all together, and AirPlay is the icing on the cake.